This cycling route will take you from Riga along the West coast of the Baltic Sea of Latvia and Lithuania. On the way the route passes the sea resort Jurmala with 19th century wooden archicture, the picturesque Abava river valley, geologicaly interesting steep banks of Jūrkalne, historically exiting city of Liepaja with great ambience and charming Kuldiga with the widest waterfall in Europe. In Lithuania the route goes through Palanga where Amber Museum is located and culminates at the National Park of the Curonian Spit with 60m high sand dune. Optinal: transfer to the hotel. A ride through Jūrmala - the most popular resort town in Latvia. Beautiful beach, old wooden villas and lively pedestrian streets. Overnight in the guest house in Tukums surroundings. Cycling: Tukums – Vecmokas – Pūre – Kandava – Plosti (Sabile) (~36km, 11km of this distance – on a major traffic road). Cycling: Tukums – Sāti – Grenči - Zemīte – Kandava – Plosti (Sabile) (~48km, 15km of this distance – on a gravel road). Cycling: Tukums – Abavnieki – Kandava – Plosti (Sabile) (~36km, 22km of this distance – on a gravel road). The part between Kandava und Sabile is very picturesque with small hills and with a view of the Abava river valley. Overnight in 2-room camping cabins - WC/shower shared by those, overnighting in the 2 rooms of a cabin. Cycling: Plosti - Sabile – Kuldīga (~49km, asphalt). Kuldīga – a charming small town with romantic wooden buildings, the widest waterfall in Latvia. Overnight in the guesthouse near Kuldiga. A unique steep bank of the Baltic see at Jūrkalne. There are so called blue cows grazing on the coastal meadows – a very rare cow type that is to be seen only here. Overnight in the guesthouse in Pāvilosta. Cycling: Pāvilosta – Vērgale – Saraiķi – Liepāja (~55 km, 6 km of this distance - on a gravel road). Cycling: Pāvilosta – Akmeņrags – Ziemupe – Saraiķi - Liepāja (~55 km, 36 km of this distance - on a gravel road or a forest road). The route goes along the seashore with lonely beaches and good opportunities to take a swim. It is possible to have a leisure evening in Liepāja town with many nice cafes. You can also venture to the once closed military town – residential area of the Soviet Army and the former port of submarines. Overnight in the hotel in Liepāja. Cycling: Liepāja – Grobiņa – Bārta – Kalēti - Skodas - Mosedis (~70km, 7 km of this distance – on a gravel road, the rest on smaller traffic roads, asphalt). 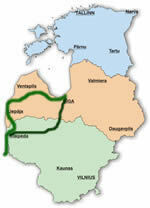 The route goes through the Žemaitijos national park in Lithuania. You will see the „Town of Stones“ – a farmstead, where the yard is decorated by many stones – small and big, hewed and natural. There is a walking trail along the river Bartuve. Overnight in the guest house in Mosedis. A ride through the Salantai regional park with beautiful hilly landscapes and a river valley. In Kretinga town you can see the cloister, the church and the Winter garden of the count Tischkevich. Overnight in the guest house in Kretinga. Resort town Palanga. The route goes along the seashore, through the Pajūrio regional park. Leisure time in Klaipeda in the evening. Overnight in the hotel in Klaipeda. Ferry passage: Klaipeda – Smiltyne (~ 1,80 EUR return ticket). A ride through the national park of Curonian Spit – up to 60m high dune. Under the sand, winds have buried several fisherman villages. The movement of the sand is partly stopped by human efforts. In Smiltyne you can see the Sea museum and the Dolphinarium, which is installed in an old Prussian fort. Overnight in the hotel in Nida. Cycling: Nida – Klaipeda (~55km, asphalt). In Juodkrante you will see the Hill of Witches.